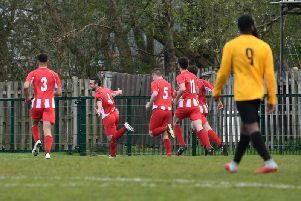 James Hatch bagged a brace as Leighton Town made light work of Oxhey Jets to reach the FA Cup Preliminary round. Hatch netted Town’s second and fourth goals in a man of the match performance, with Kai Ashley and Lorrel Smith adding the others to book their spot in the next round. “It was a really good performance,” said manager Scott Reynolds afterwards. “We got better as the game went on. In the first 20 minutes, there wasn’t much between the sides. With Leighton’s Bell Close home still being renovated, the teams played at the home of Berkhamsted Town. The opening was a little slow and tentative from both sides and openings were few and far between. Club captain Dom Marsala had the games first real opportunity with a neat run on the far side and he cut it to shoot he couldn’t get his shot away or pass back and Jets keeper Harry Beaumont did well to claim. Town finally got the goal their pressure had warranted with Ashley getting the first of the game just on the stroke of half time. Danger man Marsala made a strong run and played in a incisive cross to Ashley who was on hand to slot it home. Brad Kirkwood in the Leighton net did well to deny Jets an equaliser early in the second half, and when Hatch doubled the lead with a cool finish, the writing was on the wall for the visitors. Smith then got Leighton’s third with skill. His first touch looked heavy but he took the ball round the defender and poked it past the keeper. Some say that attack is the best form of defence and that’s exactly what the hosts did getting a fourth soon after. Hatch got his second of the game after an inviting cross from Towell found him, his shot took a deflection but it was still enough to go past Beaumont and into the net.